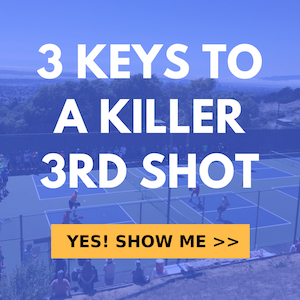 We all have to start somewhere with technique but far too often we see beginning pickleball players making this #1 critical mistake when they first start playing. When first starting to learn to play and to learn the dink, many players naturally assume what we refer to as the 180 degree angle with the area and paddle. The visual of what this position looks like will be made clear in the video. The 180 degree position is certainly one that comes naturally to most people but unfortunately it has some major technical flaws that lead to more pop ups which opens you up to more attacks from your opponent than necessary. Also, this flawed position leads to the ball bouncing to high of the ground which also make it more attackable than necessary. In the video, we’ll cover the correct 90 degree angle paddle position. It’s more stable, your less prone to overuse your wrist and you’re able to put backspin on the dink which helps to keep it low after it bounces on your opponents side. Not only this, but the 90 degree arm to paddle position is also the basis for all other strokes in the game such as the drop, the serve as well as groundstrokes. You will want to learn this position and implement it because otherwise it will be very difficult to go beyond a certain level of the game. You will be limiting your progress potential. Check out the video for all the details on how to get your pickleball game started on the right foot.